Bulbs ordered for my new flower garden — I hope! So I’ve been slacking this past week. Meant to get all my bulbs ordered, but I had problems with two separate websites. When I called one of the companies, I was told there were problems with the Internet ordering system and was asked to try back another day. The other company’s sale ended that day, so I resorted to good old snail mail. I’m curious to find out whether they’ ll honor the sale. I did get envelope postmarked by the sale’s end date after all. I’ve never ordered bulbs via a company’s website (hell, I’ve never ordered bulbs! ), so I don’t have any experience as to whether the Internet ordering issues are common. I order plenty other stuff via online (including the new iPad I’m writing this post with), and 99 percent of my experiences have been good. Anyway, about the actual bulbs. I spread out my catalogs on the floor and started placing cut-out photos of the ones I thought would work on a dry-erase board. 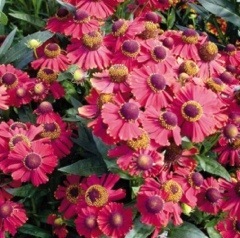 I tried to pick a variety of colors and types (Helenium Red Jewel, above) that would bloom at various points of the spring/summer/fall in order to have color all season long. I tried to figure in flowers of a descending height from back to front of the space, too. I didn’t talk about tomatoes last time because I realized that when I looked in the bag of seed packets I had saved, there were no tomato cards. I checked my garden shack to see if maybe that’s where I tossed them when I put the tomato cages away in the fall. No dice. I found just one – a card for cherry tomatoes (Chef Jeff’s Sweet 100, 62 days to maturity).